NOT ONE BUT TWO HOUSES IN TOWN! SPACIOUS HOME - GREAT FLOORPLAN - BIG VIEWS! Out of all of the diversity found in the 1 percent — the most wealthy in history — the one common thread is that they owned real estate. Building a real estate portfolio and becoming a landlord can be one of the best wealth creation tools available. But, if you’re not careful it’s also one of the easiest ways to lose a lot of money. Cash-on-cash. Market comparables. The 70 percent rule. It is easy to fall into “analysis paralysis” with the investor vocabulary. When it comes down to it, there is a shortlist to look at when choosing a good investment. This list begins with an honest look at your financial situation along with specific goal setting. Below, I’ve listed 11 characteristics that will help you filter out the money pits from the money pots either for yourself as an investor or for a client that is a potential real estate investor. Before you can even set goals, you must take an honest look at where your finances are presently. Make a balance sheet and a cash flow statement for yourself. Though, this can be difficult, it presents a tremendous opportunity to advance your emotional health and thereby your financial health. I recently did this and found a loser property in my portfolio. With this new knowledge, I can dump the property and 1031 into another. Never stop reviewing financials. They will provide new insights and opportunities regularly. Remember, a balance sheet has all assets in one column and all liabilities in another column. It will help you measure principal paydown over time, debt to equity ratio and net worth. Remember, a cash flow statement looks at money going out and subtracts it from money coming in. I recommend you do this with each investment individually so you can measure individual performance. This exercise will help you set expectations for each new investment. It will also help you decide whether you should keep a property or trade it for one that will perform to a higher standard. Remove emotion and take an honest look at your financial position. Now that you are armed with the facts and you have taken on your emotional and financial health head on, set a goal. Keep it simple. Increase net worth by 3 percent in the next quarter. Increase cash flow by $4,000 over the next year. Remember, the reason you are here is to increase financial freedom. This will save you time in your property search. Any properties that are outside your loan qualifications on the loan or cash available are automatically disqualified from your list of potential investment properties. Whoa! That was a mouthful. In simple terms, you are going to estimate a budget next. Before you buy a rental property look at what comparables properties are renting for in the neighborhood and then check how many of those properties are actually rented. This will tell you two things — gross potential cash flow and likely vacancy expense. Next you will need to estimate expenses. Taxes, insurance, and maintenance will be the most common. You may have others to address such as utilities or homeowner association fees depending on the property. Do not get too overwhelmed with this section. Ask another investor in the area or talk to a property manager about expense ratios in the area. Age of the property will be a significant indicator of the likely expense ratio. Now, shove this proforma into your balance sheet and cashflow statement that you already created. Ask yourself, is this property going to provide a step toward my goal? Note: If your goal is freedom, doing your own maintenance to increase returns does not meet your goal. Real estate markets are constantly in flux. National real estate trends might set the overall tone, but it’s all about local conditions. In order to secure long-term rental demand, you need to make sure you’re buying properties near sustainable supports — hospitals, universities, transit hubs, shopping and entertainment. Identify up-and-coming areas. These are areas that are likely to see above market increases in value (net value increases more quickly). Identify areas that are likely to see below-average increases in value. Take a drive, and these areas will become more apparent to you. If you want to go in-depth here, talk to your planning and zoning department. They will be able give you information on commercial and residential growth plan for your city. This information is invaluable when considering where the up and coming areas are. Stay tuned next week for characteristics six through 11. This post was written by Jake Durtschi, the owner of Jacob Grant Property Management located in Idaho Falls, Idaho. Jake and his team manage over 400 rental properties in east Idaho. He is a successful real estate investor and has been featured on several reputable industry podcasts. New Listings! 4 Brand New In Town Condos! Puertas Pintadas Units 13, 14 and 19 and 20! "Casa Fernando" Unit 13, is a one level, 1164 sq ft, 2 bedroom, 2 bath plan with over-sized one car garage. Open kitchen with work/dining island, deep rich wood cabinetry, flagstone counter tops and handy pantry closet. Stainless appliances include a 5 burner cook top and convection oven and a deep stainless sink. Custom tin works chandelier in dining area. Dramatic high ceilings with vigas. Tall divided light windows and doors. Gas kiva fireplace. Wood floors in main living areas, flagstone tile in baths and sumptuous carpet in the bedrooms. Beautiful bathrooms with flagstone counter tops. Double sinks in master bath. Walk in closet. Ceiling fans. Recessed lighting. Spacious, fenced back yard and covered patio. Walled courtyard with a latilla awning with access by both bedrooms. Delightful floor plan! "Casa Loma" Unit 14, is a two level, 1661 sq ft, 3 bedroom, 3 bath plan with over-sized one car garage. (One bedroom and bath on main level.) Gorgeous entry with display nicho and dramatic arched doorway to great room. Open kitchen with work/dining island, deep rich wood cabinetry, flagstone counter tops and handy pantry closet. Stainless appliances include a 5 burner cook top and convection oven and a deep stainless sink. Custom tin works chandelier and wall sconces. Dramatic high ceilings with vigas. Tall divided light windows and doors. Gas kiva fireplace. Wood floors in main living areas, flagstone tile in baths and sumptuous carpet in the bedrooms. Beautiful bathrooms with flagstone counter tops. Double sinks in master bath. Walk in closet. Ceiling fans. Recessed lighting. Spacious, fenced back yard and covered patio. "Casa Canon" Unit 19, is a two level, 1453 sq ft, 2 bedroom, 2.5 bath plan with over-sized one car garage. (Half bath on main level.) Open kitchen with work/dining island, deep rich wood cabinetry, flagstone counter tops and handy pantry closet. Stainless appliances include a 5 burner cook top and convection oven and a deep stainless sink. Custom tin works chandelier and wall scones. Dramatic high ceilings with vigas. Tall divided light windows and doors. Gas kiva fireplace. Wood floors in main living areas, flagstone tile in baths and sumptuous carpet in the bedrooms. Spacious second floor landing. Master bedroom has access to a wonderful second floor outdoor deck with latilla roof for dramatic, dappled light. Beautiful bathrooms with flagstone counter tops. Double sinks in master bath. Walk in closet. Ceiling fans. Recessed lighting. Walled back yard with covered patio. "Casa Pueblo" Unit 20, is a one level, 998 sq ft, 2 bedroom, 2 bath plan with a welcoming, long, bricked front portal. Open kitchen with work/dining island, deep rich wood cabinetry, flagstone counter tops and handy pantry closet. Stainless appliances include a 5 burner cook top and convection oven and a deep stainless sink. Dramatic high ceilings with vigas. Divided light windows and doors. Gas kiva fireplace. Wood floors in main living areas, flagstone tile in baths and sumptuous carpet in the bedrooms. Beautiful bathrooms with flagstone counter tops. Walk in closet. Ceiling fans. Recessed lighting. Walled back yard and covered patio. A Slice of Taos History - Gorgeous Pueblo Revival Adobe Home on 5.19 Irrigated Acres! Way back...early 1950's Gordon (Slim) Bastian and his wife Lillian built this extraordinary pueblo revival, adobe home, in the style of famed adobe designers Wilfred and Myrtle Stedman, on 5.19 acres of land with water rights. This location was perfectly private for full time living but also provided easy commercial access for Slim's TV repair shop! Slim passed away in 1993 but ask any long time Taos residents where they used to get their TV's repaired and certainly they will talk about Slim Bastian. Fast forward, 2015...this remarkable adobe home offers the grace of yesteryear with all the modern conveniences. The house is approximately 2944 sq ft with 2 bedrooms, office, and 2 baths PLUS the 2 attached but private 1 bedroom, 1 bath guest suites where the TV repair shop used to be. 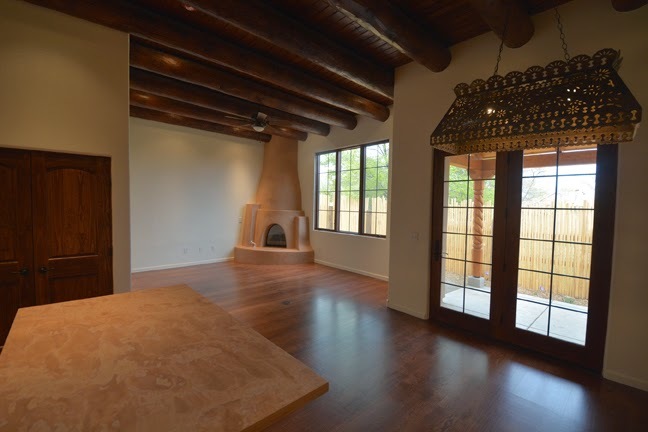 Main house has gorgeous wood floors and 3 Carmen Velarde wood burning kiva fireplaces, museum quality character with carved wood doors by Elidio Gonzales, gorgeous latilla and viga ceilings and newer divided light windows that capture the pueblo revival character. The 2 guest suites are large, have beautiful baths and can be used in a variety of ways...studios, offices, rentals, or just for your own guests! Lots of versatility here. Beautiful patios, portals. 5.19 acres with surface water rights (that are being used!) orchard, and stunning views! The property is zoned County but also commercial within the Upper Colonias Neighborhood Association Zoning. So make this property your private oasis with easy access, or a bunkhouse, B&B, home office, studio, business or?? ?